Commander of Iranian ground forces says in speech that Iran produces its own weapons, does not have to feel threatened by Israel. 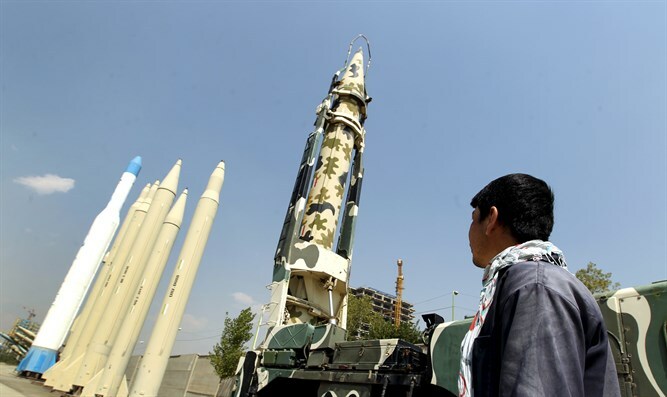 An Iranian general stated that a date has been set for the destruction of Israel. Brigadier General Kioumars Heydari, the commander of the Iranian ground forces, said in a speech that Iran's army is "much stronger than in the past" and that Israel can no longer threaten the Islamic Republic. The Iranian news agency Mehr reported that the general said that "the date has already been set" for the destruction of Israel. Heydari delivered his speech ahead of Iran's "Army Day", which will begin tomorrow (Wednesday), on the same day Israel celebrates its Independence Day. He stressed that unlike Saudi Arabia and other countries in the region, which import weapons from the West, his country produces its own weapons. Iran's military budget for 2017 was $15.9 billion, an increase of almost 65% from 2014. The Revolutionary Guards budget showed the greatest increase of any Iranian military branch, rising from about $4.5 billion in 2016 to about $7 billion last year. Iran's Defense Minister, Brigadier General Amir Khatami also stressed on Sunday that Iran has reached the point where it produces its own military weapons and even exports them. "We are determined to defend our country and the security of the countries of the region, and when other countries seek to create chaos in the region, we must equip ourselves to defend," Khatami said in a debate in the Iranian parliament. "Fortunately, today we enjoy the possibility of producing better weapons than those which currently exist in the world." Tensions between Israel and Iran have been rising over Iran's military presence in Syria. On Friday, the IDF revealed that an Iranian drone which violated Israeli airspace in February had been carrying explosives. In addition, Iranian soldiers were reportedly killed in an alleged Israeli airstrike against a military airbase belonging to the Assad regime near the Syrian city of Homs last week. On Tuesday, Israeli security officials revealed that Iran is now preparing for a direct assault on Israel, using its growing military assets on Israel’s northern border to strike targets inside the Jewish state.